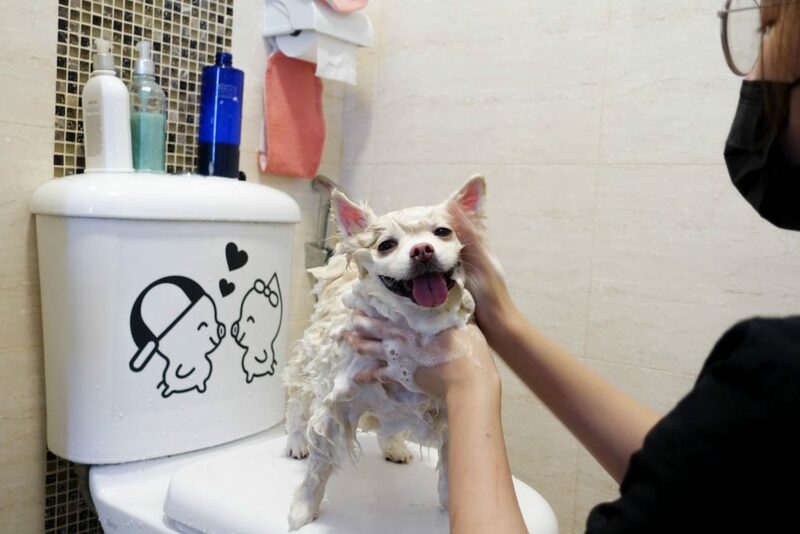 Pet groomer May Koh takes pride in helping dogs look good and feel good right in the comfort of their own homes. Meet May Koh, 30, the owner of home-based dog grooming business Dosch Coiffeur. She is also the proud owner of 3 poodles. The former marketing executive used to have to take her dogs to pet grooming salons monthly. The grooming fees, together with the transport expenses, were adding up fast. To save money, the Republic Polytechnic graduate started taking classes in 2013 to learn how to groom poodles. Now, she is certified to groom all breeds of dogs. Ms Koh is among some 280 certified dog groomers in Singapore, according to Singapore Kennel Club. She works 5 days a week, with 4 to 6 appointments each day. 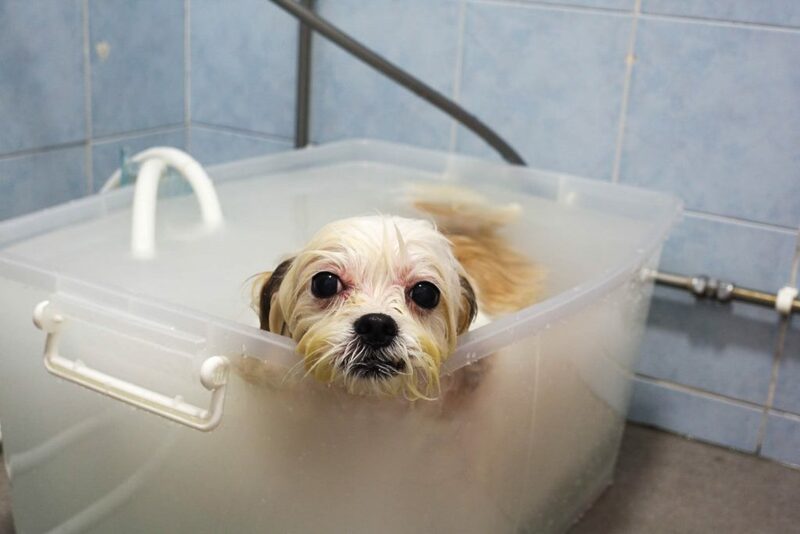 Some 200 dogs have tried her services, ranging from showering, spa, basic to full grooming. The UrbanWire follows her for a day to take a look at how she pampers her clients’ dogs in the comfort of their own homes. Yuki is Ms Koh’s first customer of the day. It’s also her first-time customer. The owner of this white Pomeranian found out about Ms Koh’s home-based service from a Facebook group for dog owners. 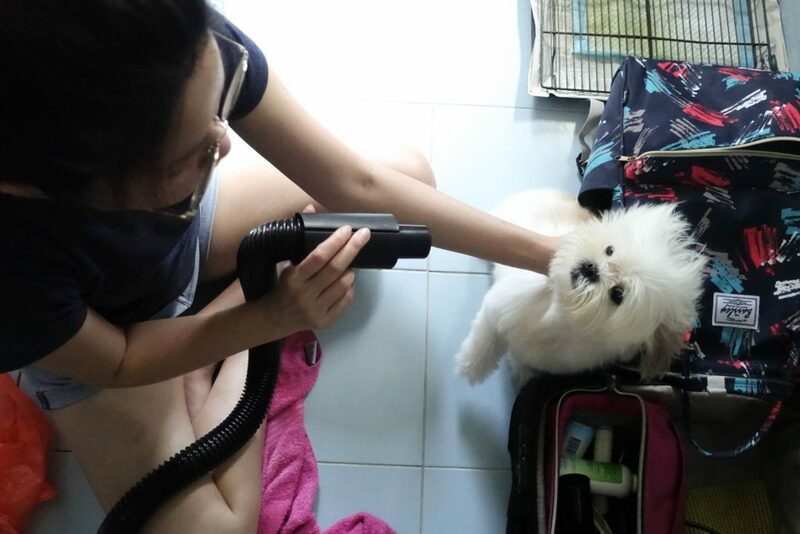 Besides giving its thick, fluffy coat a trim, Ms Koh also showered Yuki with her homemade shampoo. Many of Ms Koh’s customers engaged her after reading positive reviews about her service on Facebook. Word-of-mouth referrals are also very important for a freelancer like her. Business didn’t used to be as brisk when she charged $75 for a full grooming session and another $25 to cover her 2-way transport expenses. 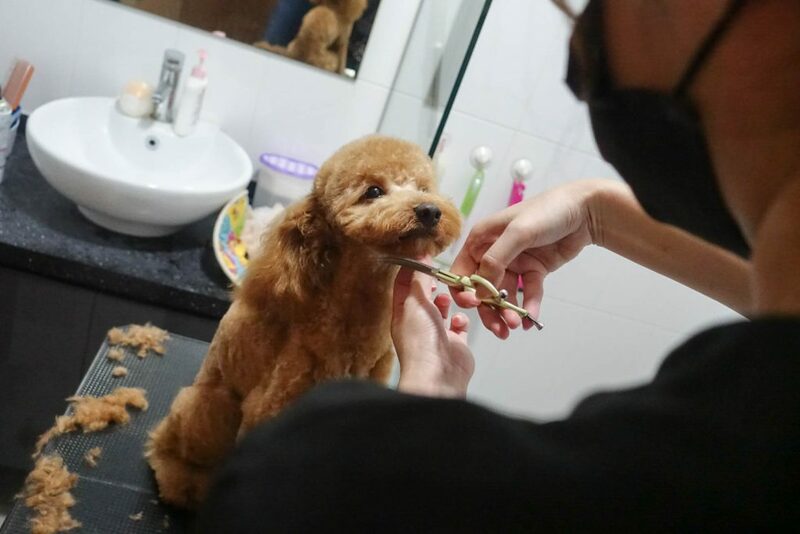 “They [The customers] see the price as a whole … that $100 for home grooming is way too expensive,” Ms Koh recalled, adding that the market rate for full grooming is $60 to $85. She thought of giving up in 2016, but a close friend encouraged her to persist and she then marketed her business more aggressively on social media. 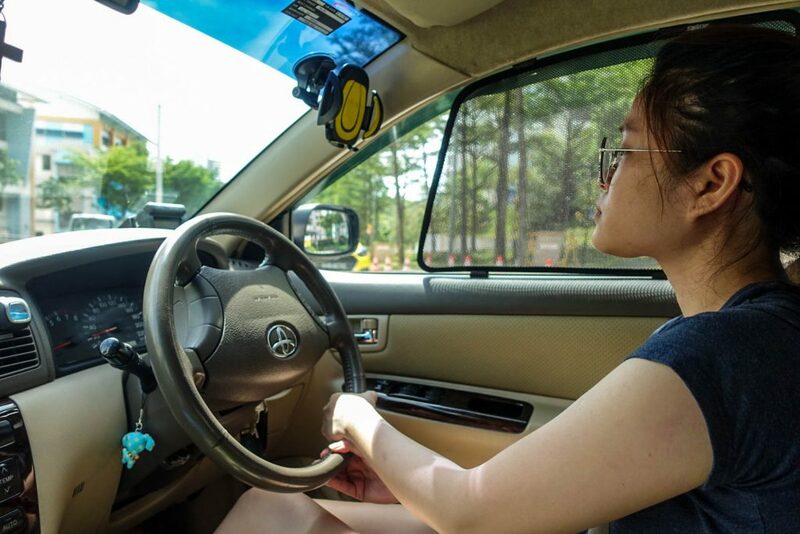 She also got a driver’s license so she could absorb the transport expenses. Ms Koh’s next appointment brought her to an apartment in Senja. Here, she gave Bubble, a tiny, fluffy Malshi a relaxing spa therapy. 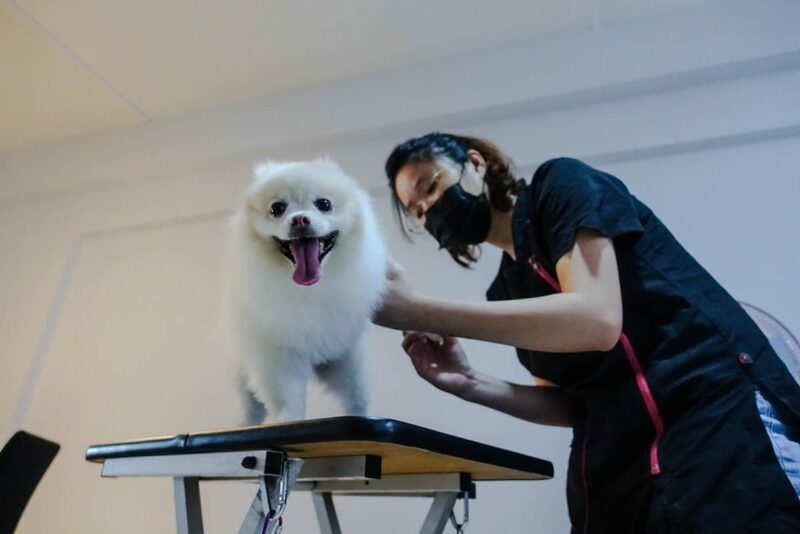 When dogs are being groomed at their own homes, they tend to be less anxious and more cooperative, Ms Koh said. But every dog is different, so she still takes great care while handling them to prevent injuries. “Even though you have fantastic grooming skills, you must be able to read the dog’s body language and their reactions to your touch. Safety handling is most important,” said Ms Koh. 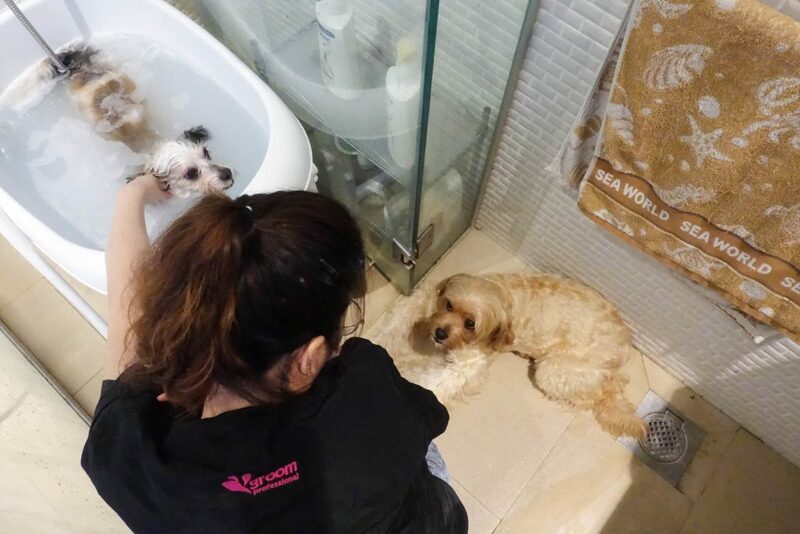 At this Yio Chu Kang home, Coby and Barbie took turns to enjoy a spa service under Ms Koh’s watch. Many of her customers have commended her gentleness, patience and the ability to make grooming a stress-free affair for their pet dogs. In response to such compliments, Ms Koh said it’s only through this line of work that she has learnt to be more patient and composed. 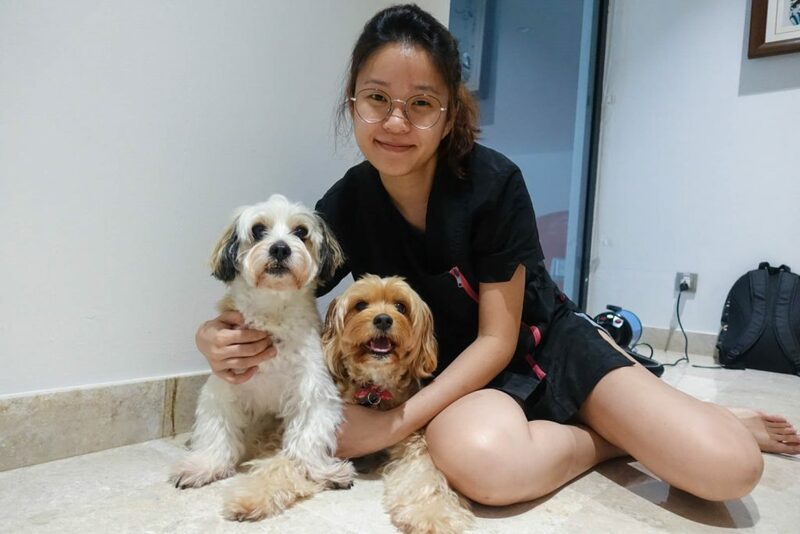 Ms Koh’s last appointment of the day ended only at 8:30pm, after she groomed a brown cutesy poodle in a Punggol home. She said she would continue providing home-based services for her long-time customers, even if she were to set up shop in the future. When she does, she hopes her grooming salon can also offer day care and boarding services.